I need to loop lot of arrays in different ways and display it in a page. The arrays are generated by a module class. I know that its better not to include functions on 'views' and I want to know where to insert the functions file. Create a file and put the following code into it. Save this to application/helpers/ . We shall call it "new_helper.php"
The first line exists to make sure the file cannot be included and ran from outside the CodeIgniter scope. Everything after this is self explanatory. If you use this helper in a lot of locations you can have it load automatically by adding it to the autoload configuration file i.e. <your-web-app>\application\config\autoload.php. Another benefit from this approach is that you don't have to worry about adding the CI instance as you would if you use custom helpers to do all the work. Create a file with the name of your helper in /application/helpers and add it to the autoload config file/load it manually. 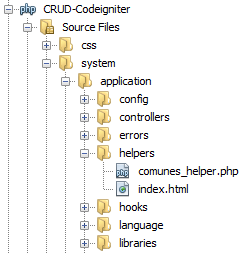 Now you can either load the helper via $this->load->helper(‘user’); or add it to application/config/autoload.php config. $lang = $this->config->item('language'); The function returns FALSE (boolean) if the item you are trying to fetch does not exist. // Loads a config file named blog_settings.php and assigns it to an index named "blog_settings"
Not the answer you're looking for? Browse other questions tagged php codeigniter codeigniter-helpers or ask your own question. Do I use a helper, library or place my datepicker code in a model in codeigniter? Should I extend Controller or Create Helper?